Is your premium WordPress theme killing your sales? You’d be surprised to find the answer. But first, let’s get some statistics straight. 67% of consumers are willing to buy a product or use a service on a mobile-friendly site (Source: Google Research). 70% of mobile searches result in action being taken within an hour as opposed to a week for desktop (Source: Mediative Labs 2012). 48% of mobile users start on search engines. It needs no convincing that internet usage on mobile has surpassed that of the desktop and mobile has become the primary platform for buyers. Evidently so, WordPress theme developers are optimising their themes to be responsive and mobile friendly. But I’ll just call their bluff. A mobile-responsive theme is a more of a pointless pitch than a true feature of mobile-experience. It’s quite unthinkable that someone would be using their laptop to surf, search or shop when waiting at a train station or airport. The hand subconsciously reaches into the pocket and the smart-device comes into play. People open up Facebook, Twitter and that’s where the journey begins. If you are a digital marketer, you’d know that. But then you reach your stop, perhaps your flight is there and you have to move on. Contrast this to someone on a desktop, patiently in their home/office, keenly searching for something with advanced google-search-operators, landing up on a product-review and with all the time at their disposal diving into the ocean of information, 200 browser tabs, cross referencing, verifying, making notes and taking their sweet time to click the buy button. 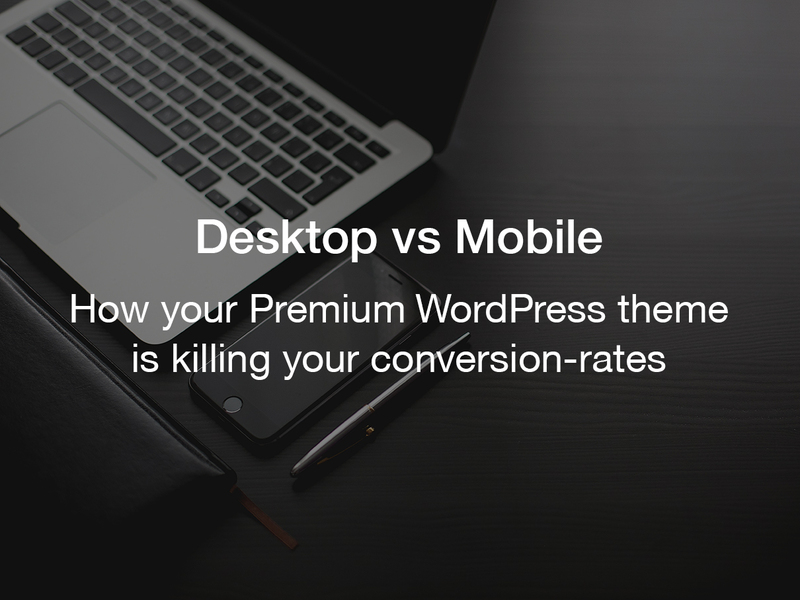 People browsing your site on a mobile have a very different attention span as compared to someone on a desktop. And you have a very limited time to make a conversion. Extending on the above point, the usage behavior of a mobile user is very different and quite unpredictable than someone using their browser on a desktop/laptop. The way people interact with websites on a mobile platform is radically different. There’s no mouse and keyboard. People love to use gestures than to tap into an input-field and waiting for the keyboard to pop up for typing. Sliders aren’t necessary on a mobile-site. Pop-ups, light boxes are a big no-no and on mobile, size definitely matters! Additionally, you never know what’s waiting on the other side of the screen. It could be a teenager (who may not be a decision maker yet can influence the sale), a slow connection, dying battery or even a slow mobile CPU. If you’ve bought a premium mobile-ready WordPress theme and have been assuredly running it hoping that it’s working for your visitors, think again. The larger number of responsive WordPress themes are focused on resizing and rearranging content. This doesn’t improve conversion rates or user-experience. On top of that almost all responsive WordPress themes are deployed as-is without considering suitability for your specific site-purpose, visitor experience and site-content. O-o that’s not really gonna work! A custom mobile experience that boosts your conversion-rates and sales warrants the use of template level control of what’s presented to the visitor based on their platform or device used to view the website. The above factors make a very strong case for a customized mobile experience. Short attention spans warrant a to-the-point communication of information and a no-nonsense approach to CTAs and conversion. A dedicated mobile website also keeps web page resources to a minimum and eliminate code bloat. A dedicated mobile website also to a large extent eliminates the need for a mobile web app. Mobile websites are dedicated to a customized mobile-experience and work flawlessly. A custom mobile experience that boosts your conversion-rates and sales warrants control of what’s presented to the visitor based on their platform or device used to view the website. It is this feature that helps speed-up websites, improve rankings, mobile-readiness, visitor experience and cutting edge conversion rates. So what does it take to get a dedicated mobile port of your website developed? Almost or more than what it would take to develop your current website. It’s a fully custom design and where mobile experience is concerned, the price is premium. It will need to be developed separately from your existing website yet integrated with it to allow creating and pulling the same content. There will be time-effort overheads while managing and maintaining the site. And all this implies inflated costs. If the above is not reason enough then there’s no reason why you should ever dump your theme. But if your livelihood depends on your business and sales then it’s time to get the competitive edge. No matter how good, feature-rich, standard compliant a theme is, if it doesn’t cater to your customers and your business, there’s no reason to put up with it. Even mobile-first themes don’t cut it. That’s because all mobile-first themes are coded to eliminate resource usage (which in turn boosts site speed). This is good from the point of site-speed. But mobile-first still is responsive design done another way. It doesn’t really give you control of customizing the mobile experience. A custom mobile experience that boosts your conversion-rates and sales warrants the use of template level control and being able to decide what’s presented to the visitor based on their platform or the device used to view the website. How about this: you get to control what headline you’d like to pitch to your mobile visitors vs your desktop visitors. It’s the difference between “Amazingly powerful blue widgets designed to keep your floor clean and eliminate germs” and “Blue Widgets for perfect health”. It’s not about the copy, it’s about the effectiveness of short pitches that can make an impact in a short attention span. It’s not about what you present to the mobile users — it’s about what you choose not to present to your mobile users. It’s about customizing and taking control of the experience to aid the visitors on a viewport that’s technically limited yet growing by leaps and bounds. Lander WordPress theme is designed for this very purpose — easy creation of powerful landing pages with template level control of what you want to show or hide on desktops and mobiles. This essentially allows you to turn any page to a landing page. Lander allows you to have a dedicated mobile port of your website without the hassle of development, maintenance and cost overheads. Check out the features of Lander WordPress theme here. Next time you find a promising landing page coming up in Google Analytics, you will be able to customize its experience, tweak it to what works the best and optimize the conversion rates. Template level control of mobile viewport is relatively new and perhaps unheard of. Coders find it a marketing gimmick and marketers are yet to realize the sales performance and conversion rates they can squeeze out of it. But all the above points are reason enough for coders and marketers alike to explore the new realm of template level mobile control in WordPress themes to improve rankings, conversions and sales. As a CRO I couldn’t agree more. I honestly haven’t tried Lander, but am thrilled a premium theme builder is thinking this way. We have been experimenting with google’s AMP and Facebook’s Mobile pages recently – sure they are fast and yes their ‘design’ is rough to say the least – but what gets completely forgotten is the user experience you want your mobile customer to have. They aren’t going to read 2,000 words or download your print-ready PDF. We’ve had great success with template level control in Genesis. Serve the viewer exactly what they need and no more. It does creates loads of page templates and does more than double the price of complete projects… On the positive side, since the change is made almost on a page by page basis, you can very easily test (A/B) specific pages before starting the whole undertaking.